Charles Garfield Tracy was married to Rhea Lucille Snow (1896-1976) from April 10, 1918 in Farmington, Utah, until his death, September 11, 1955 in Arcadia, California. When they married she was a resident of Utah, having lived to age five in a Ladder Day Saint’s family commune at Beehive House. It had been built in 1854 near the Salt Lake City Mormon Temple to accommodate LDS founder, President and polygamist, Brigham Young and his wives and children. Rhea lived there the first five years of her life because it was the official home of her father, Lorenzo Snow (1814-1901), the Fourth LDS President since Young’s death in 1877. Rhea’s mother was Sara Minnie Jensen Snow (1855-1908), and she and Lorenzo had nine children. Rhea became the youngest and last surviving of Lorenzo Snow’s six wives and 42 children. In adulthood Rhea became an actress in vaudeville and motion pictures, wrote scenarios and radio plays, taught drama, authored several books and many poems and later as a widow and resident of Utah, served in California on behalf of the Indian Affairs Committee. She is buried in Brigham City Cemetery in Brigham City, Utah. In 1919, Charles and Rhea Tracy had a daughter, Mauvia Snow, born in Salt Lake City, who became a highly respected health professional in the San Francisco area and also remained a member of the LDS Church. A second daughter, Norlyn Snow, was born to Charles and Rhea in 1922 in Manhattan Beach, California. This daughter became a noted public speaker for the LDS Church, and in her obituary it was written: “Her father was Charles Garfield Tracy, a motion picture director, experienced vaudeville actor and renowned artist.” This description would suggest that Charles and Rhea Snow Tracy met when both were active in theatre. Published in the Deseret News on May 6, 2011. Born in Pennsgrove, New Jersey and raised in Chicago by German immigrant parents, Ernest Hennings became a highly recognized painter of western subjects, particularly of Indians of New Mexico where he joined The Taos Society of Artists. Of his painting, it was written: “He was most successful in unifying the human figure with a sunshine-filled, happy, natural setting.” (Zellman 808). The last project of the artist before his death in 1956, was a series of paintings at the Navajo Reservation in Ganado for a Santa Fe Railroad calendar. When he was young, his family moved to Chicago, and for five years, he studied at the Art Institute of Chicago from which he graduated with honors. After working six years as a commercial artist, he enrolled in 1912 at the Munich Academy in Germany where he learned to paint in the style of academic realism. 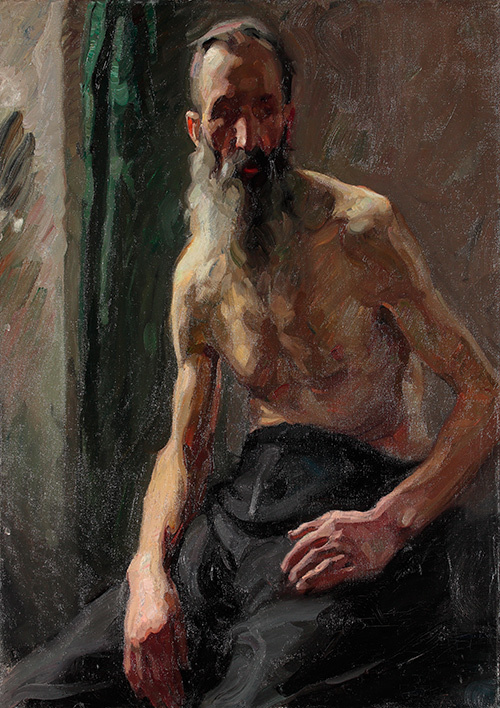 Walter Thor, a portrait artist, was one of his highly influential teachers, and he emphasized the need of the artist to enter the soul of their subjects. Hennings also studied with Franz von Stuck, a proponent of classical theories of beauty, patterning, craftsmanship and drafting. At that time pre-war Munich was one of the most exciting cultural centers in Europe, and the battles between classical academy art and “Jugendstil,” a German Art Nouveau movement were in full swing. Hennings remained somewhat open to the latter theories, thinking it best to be open to a variety of influences and then settling on one’s own style. In Munich, he also became friends with artists Walter Ufer and Victor Higgins. In 1915, at the beginning of World War I, he returned to Chicago as a commercial artist and muralist who tended to paint with thick, broad brush strokes and darkened palette of the Munich School. But he also reflected the waving, sinuous lines of “Jugendstil” painters. In 1917, Carter Harrison, a wealthy patron and former Mayor of Chicago, and Oscar Mayer, Harrison’s partner in an art-buying ventures, sponsored Hennings on a trip to Taos, New Mexico, a life-changing venture for Hennings. Three years earlier Harrison had done the same for several other artists including Ufer and Higgins. In 1921, Hennings became a full time resident of Taos, having had a successful one-man exhibition in Chicago at Marshall Field and Company. At that event, Hennings met his future wife, Helen Otte, and upon marrying the coupled traveled in Europe for sixteen months. 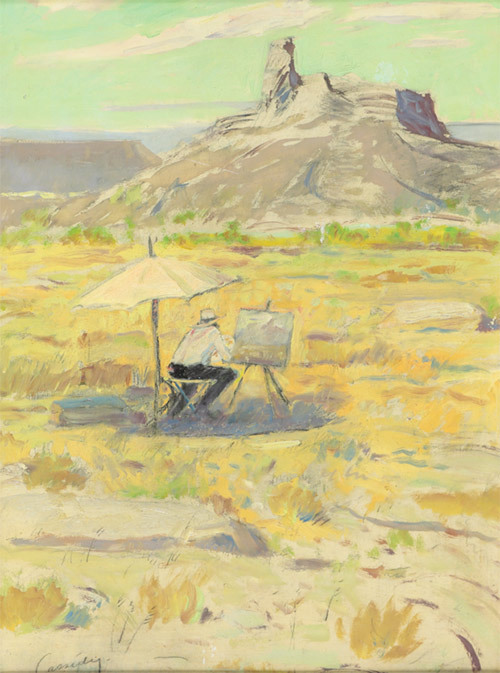 In 1924, Hennings joined his friends Ufer and Higgins as a member of The Taos Society of Artists, whose purpose was to generate sales of their art work. Ufer and Higgins had been members for several years. For the remainder of his career, Hennings was devoted to painting the West including commissioned portraits of Navajo Indians for the Santa Fe Railroad. However, his primary subjects were the New Mexico Indians, which he portrayed as dignified heroic people. His technique was to paint the background first and then put figures in various positions to determine which was the most successful composition. He worked on several canvasses at once and disavowed modernist avant-garde movements. The bright colors of his paintings have remained intact because he applied his oil paints thinly and allowed long periods of drying before applying varnish. This method has prevented yellowing and cracking. Few of his paintings are dated. His wife, Helen Otte Hennings, kept a meticulous record, but when she moved from Taos to Chicago in 1979, it was lost, and no copy has ever been found. Bill Gollings (Elling William) did paintings known for their accurate accountings of the Old West. Gollings drew upon his own personal experiences as a cowboy, and was also known to have studied and admired the drawings of Frederic Remington, which often appeared in ‘Harper’s Weekly’ magazine. Bill Gollings was born in 1878 in Pierce City, Idaho. As a boy, he spent much of his time was in New York, Idaho and Michigan. When he was twelve, he and his family moved to Chicago. At age nineteen, Gollings traveled to small mining and cattle towns in South Dakota and Nebraska where he spent most of his time as a sheepherder and cowboy. Despite his ranching activities, he had always possessed an interest in art. His first exposure to paints was at about age twenty-five when he began working with a set of mail-order paints. After selling several paintings, he was admitted to the Chicago Academy of Fine Arts on a scholarship. Returning to Wyoming, he spent time on a Cheyenne reservation as a cowboy once again. 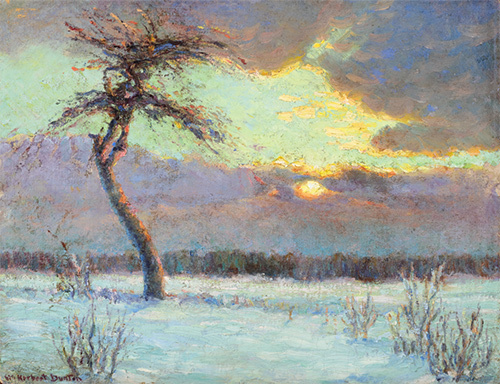 Gollings maintained his interest in art and became proficient in etching under the guidance of Wyoming artist Hans Kleiber. In 1909, Gollings built a studio in Sheridan, Wyoming, giving up ranch life. He did, however, continue to supplement his income by punching cattle and breaking horses. 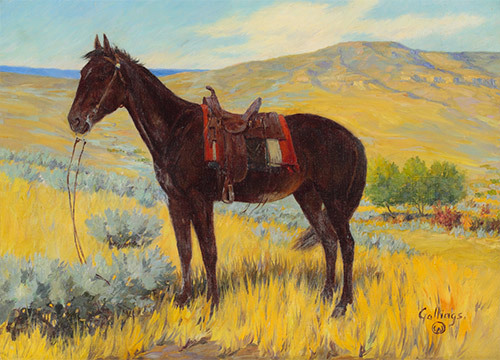 In Sheridan he devoted himself to his painting of western scenes, using “Gollings” and a pony-track symbol to sign his works. “Bill Gollings” died at age 54 in Sheridan, Wyoming in 1932. Gerald Cassidy, known for his subjects of the Southwest including Indian portraits and for his lithography, was born in Covington, KY., and grew up in Cincinnati, Ohio. He studied at the Mechanic Institute in Cincinnati and with Frank Duveneck at the Cincinnati Art Academy. He worked as an Art Director at a lithography firm in New York City and during this time, studied briefly at the National Academy of Design and the Art Students League.